There are few things better than a big scoop of ice cream on a hot Alabama day. Luckily, there are plenty of places in Birmingham where you (and your sweet tooth) can keep cool. One of those is Big Spoon Creamery. You may have seem them on Saturdays at Pepper Place. Now, you can treat yourself every day of the week at their storefront in Avondale. With an assortment of unique seasonal flavors and a selection of shakes, ice cream sandwiches and sundaes, it’s hard to only get one thing. 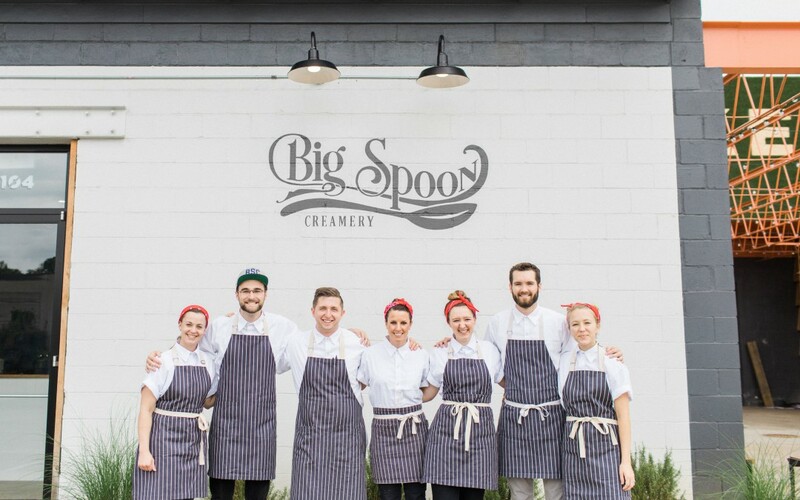 For our Tastemaker series, Big Spoon Creamery gave us the scoop on their Birmingham business. 1. What was it like starting a business from the ground up in Birmingham? Building a business from nothing in Birmingham has been an incredible journey. Although it’s been the most challenging season of our lives, it has also been the most rewarding. The citizens of Birmingham and surrounding areas love local businesses, and we’ve had enthusiastic support from the community since the beginning. We also love the entrepreneur community in Birmingham. Specifically in the food industry, it’s a tight knit community among other small business owners, and everyone supports one another. 2. Why did you decide on Avondale as the home for your new storefront? Avondale is such an exciting, vibrant, energetic neighborhood. Over the past few years, it has really turned into a hub for great food and entertainment. We feel right at home among so many other incredible restaurants and businesses. We’ve been able to offer a lot more menu items in our storefront, including our signature sundaes. “The Big Spoon” sundae, our version of a classic sundae, has definitely been a customer favorite. 4. Which flavors do you feel best represent our region this time of year? When I think about summer in the South, I think about the incredible produce our region has to offer, such as peaches, blueberries, and blackberries. This is our favorite season to make ice cream because their is such an abundance of great local produce to utilize. A couple of our summer favorites that represent our region are peach buttermilk and brambleberry cobbler. 5. Where is your favorite place in Birmingham to take your truck? Our two favorite truck locations are at Pepper Place Farmer’s Market on Saturdays, and at the Summit. Both are amazing entertainment venues in our city, and we love getting to be a part of them. Photos courtesy of Todd Helzer.